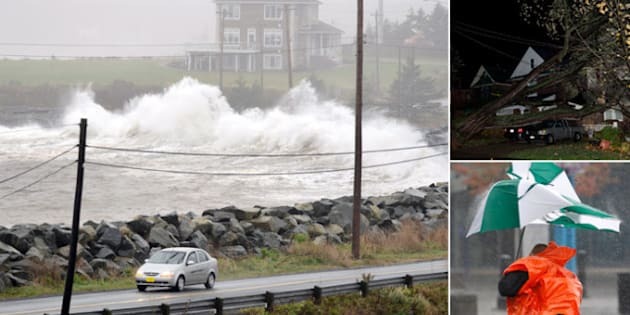 TORONTO—Southern Ontario, Quebec and parts of the Maritimes are being lashed by superstorm Sandy this morning as the massive weather system churns its way north. The destructive post-tropical storm has already wheeled through the northeastern U.S. — where it has been responsible for flooding, widespread power outages and at least 16 deaths — and is now walloping parts of Canada with strong winds and heavy rain. UPDATE: Hurricane Sandy's death toll in the U.S. has risen to 35, according to the Wall Street Journal. For forecasters, the sheer size of the storm is what sets it apart. “It’s huge,” said Rob Kuhn, a severe weather meteorologist with Environment Canada’s Ontario Storm Prediction Centre. Tens of thousands of customers lost their electricity in both Ontario and Quebec. The fierce weather is also causing travel disruptions at Canada’s busiest airport, cancelling roughly a quarter of flights in and out of Toronto’s Pearson airport and delaying many more. “Some of the strongest gusts from this storm in Canada will come in southern Ontario, especially if you’re either over higher ground northwest of Toronto or near the south shore of the Great Lakes,” Kuhn told The Canadian Press. Those gusts claimed a life in Toronto Monday night — city police said a woman had been killed by a falling sign as winds blowing at about 65 kilometres per hour whipped the city. Sandy was unleashing its wrath on New York City at the time, but the Canadian Hurricane Centre said the impact of the weather system extended over a thousand kilometres away from the storm. While the winds remain strong this morning, wind warnings have ended for all areas except Sarnia, in southwestern Ontario, which Environment Canada says had some of the strongest gusts at 100 km/h. Parts of southern Quebec and southwestern Nova Scotia will also be whipped by strong winds, but the gusts will not be blowing as hard as in Ontario. As the storm swirls its way north, officials are urging people in Ontario, Quebec and the Maritimes to take precautions through the day. At their strongest predicted point, today’s winds could down trees, hurl debris through neighbourhoods, create difficulties for motorists on highways and even make it difficult to walk down a street, said Kuhn. “If somebody loses their balance, they could get knocked over,” he said. Rain is also an issue today, but the showers, while they will be heavy, are likely to come in sporadic bursts. “There’s shots of heavy rain but it doesn’t last long. This is more of a wind storm,” Kuhn said. Showers over Southern Ontario dwindled overnight and only periods of light rain are in the forecast for the region today, while moderate rains in central Ontario are expected to diminish later in the day, according to Environment Canada. Between 20-40 millimetres of rain are expected in southern and central Quebec, though areas over higher terrain could see as much as 50 millimetres, the agency said. The precipitation could turn into snow over parts of Ontario and western Quebec, said Environment Canada. The southwestern Maritimes are also likely to experience a soggy day with rain that could persist into Wednesday with total amounts which could exceed 50 millimetres. Higher than normal water levels and pounding surf is expected along the Atlantic coast of Nova Scotia and along the St. Lawrence River. Forecasters are warning that some coastal flooding could be seen in the Quebec City region. Public Safety Minister Vic Toews has said the military and the Canadian Coast Guard are on standby to help grapple with any havoc wreaked by Sandy. Health Canada is conducting generator checks and has reviewed the National Emergency Stockpile, which contains supplies such as beds, blankets and antibiotics. Meanwhile, the Red Cross says it has 550 volunteers on standby in Ontario and the Atlantic provinces. Sandy is expected to weaken through the day, but it will be a slow process. “The winds will slowly start to slack off later this morning and this afternoon, but it’s going to be a very gradual process,” said Kuhn. Environment Canada expects winds in Ontario to drop to between 40 and 60 kilometres per hour this afternoon and predicts gusts between 30 and 50 kilometres an hour by tonight. Sandy made landfall in the U.S. Monday evening, just after forecasters stripped it of hurricane status, but the distinction was purely technical, based on its shape and internal temperature. It still packed hurricane-force wind, and forecasters were careful to say it was still dangerous to the tens of millions in its path. The storm killed 69 people in the Caribbean before making its way up the Atlantic.